You are here: Home>Archive>Olney Rugby Union Football Club>Olney rugby team photographs from 1877 to date>Olney RFC 25th Anniversary 1972 Mini and Juniors Section 1997, Under 8's. Olney RFC 25th Anniversary 1972 Mini and Juniors Section 1997, Under 8's. 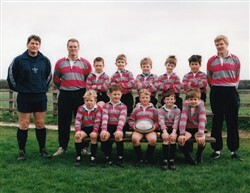 Olney RFC Mini and Juniors Section 1997, Under 8's. Olney RUFC coloured team photograph of the Under 8’s, 1996-97 players as part of the 25th Anniversary 1972-1997 Mini and Juniors Section. Names listed as: A. Welham, M. Steele, J. Jones, L. Day, J. Correa, O.Odell, J. Hedges, C. Pye, J. Maynard, N. Pearce and coaches; V. Jones, P. Odell, M. O.’ Connell.